In this video, Madaswamy describes how he switched from buying hybrid seeds to getting native seeds for free from Anisha's seed bank. Many of the hybrid seeds available to the farmers for purchase can only be used for one season and do not produce a good yield if used for a second crop. Native seeds, on the other hand, can be harvested each year and used again the following year or stored for many years. Native seeds can regenerate for decades. Because farmers were spending so much money buying hybrid seeds, and many native varieties had been lost, Anisha began to start a seed bank. The seed bank collects and stores native seeds and provides them to farmers free of charge. 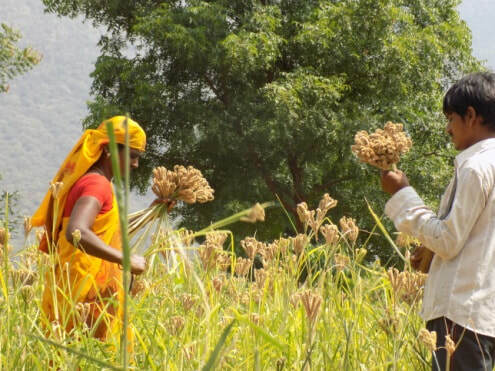 At the end of the growing season, the farmers pay back the seeds to Anisha from their harvest. The seed bank is so useful that some farmers have also started their own small collections of seeds at home and trade these with their neighbours. Anisha’s seed bank has over 250 varieties of seeds. These include multiple varieties of millet, rice and lentils as well as vegetables such as tomatoes, squash and beans. Annually, Anisha distributes thousands of seeds to residents in the Martalli region. In 2017, Anisha started to accept mailorders for seeds.